^ U.S. and Canadian Institutions Listed by Fiscal Year (FY) 2014 Endowment Market Value and Change (PDF). National Association of College and University Business Officers and Commonfund Study of Endowments. [October 17, 2015]. （原始内容 (PDF)存档于2017年2月23日）. ^ President's Office. 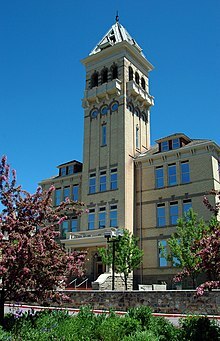 Utah State University. [January 11, 2010]. ^ 3.0 3.1 USU at a glance. 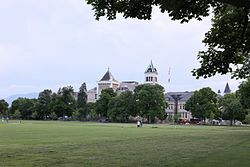 Utah State University. [December 20, 2011]. ^ 4.0 4.1 4.2 Tab C Enrollments (PDF). Utah System of Higher Education. [October 17, 2015]. ^ USU Grad Danielle Babbel Among Rhodes Scholar Finalists. 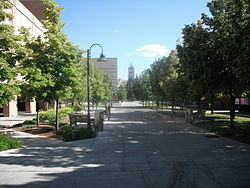 Utah State Today. [June 11, 2016]. ^ Lars Peter Hansen – Biographical. NobelPrize.org. [June 11, 2016]. ^ MacArthur Fellows: Where fellows received undergraduate degrees (PDF). MacFound.org. [June 11, 2016].